Comparative law is increasingly recognized as an essential reference point for judicial decision-making. The English courts have long been open to considering how legal problems are solved in other jurisdictions and there have been parallel developments across the Channel. Comparative law is gaining in utility and relevance in the decisions of the courts. This book is thus extremely timely, bringing together a collection of essays by distinguished jurists from the judiciary and academia, and providing an important contribution to analysis of this topic. Contributors focus on a variety of European jurisdictions, but also look at North America and South Africa. The first part of the book deals with the problems and possibilities of comparative law in national courts. Discussion ranges from the problems of proof of foreign law in national courts to legal borrowings and institutional mechanisms for international judicial co-operation in national courts. Part II, on European Law, contains a range of chapters exploring in a number of dimensions the suggestion that an intensification of comparative law methodology in the courts might be attributable to the growth and impact of European supra-national law. Part III takes the argument into the field of administrative law, an area which has traditionally been relatively impervious to comparative cross-fertilisation between European states, and finally Part IV covers a widely diverse set of topics in the field of general and mainly private law. 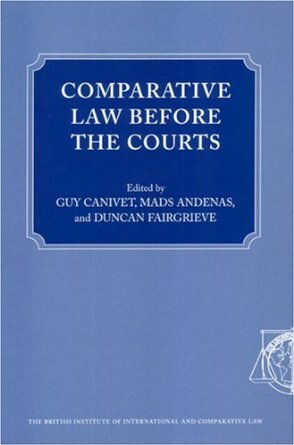 "Comparative Law before the Courts (Paperback edition)"